The Fractal Prince is the follow-up to the hit début novel The Quantum Thief that was released to a great deal of acclaim last year. Like the Quantum Thief, The Fractal Prince follows two distinct threads, which while written in a vividly descriptive and disarming style offers a vision that is so different that you really do have to give the book your complete and undivided attention. Paying tribute to the Arabian Nights (otherwise known as One Thousand and One Nights) the book is divided into a number of linked stories that all go some way to advancing the main story or building back-story of the protagonists and the world(s) they inhabit. This far future post-human tale is built on a number of artificial realities that offer the reader a completely unique experience, in order to get to grips with this book you have to let go of your preconceptions. It's not the easiest if books to read, on the one hand you have to admire the author for pushing the boundaries, for having the talent and imagination that not only describes these layers of reality in exquisite detail but also manages to keep all the threads together and offer a rich, diverse and coherent plot built in part by those little individual stories. This is the bleeding edge of 21st century scifi but as a consequence despite the elucide prose that is often poetic and awe inspiring in places the story isn't easy to follow. Part of this reason is purely due to the very nature of the plot and it's dynamic background; it is just so different that it prevents the reader forming any real frame of reference, making the whole thing very hard to relate to and at times the characters difficult to engage with. So not easy to read at all, and yet if you give it a chance, if you are prepared to concentrate then it does reward you and the reward outstrips the required concentration by far. 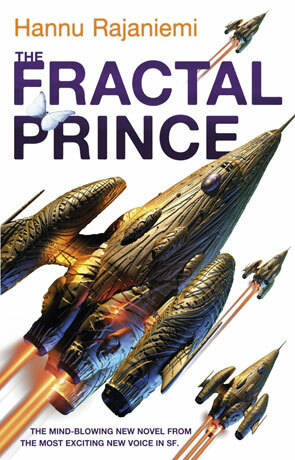 The Fractal Prince is a book that pushes back the boundaries of science fiction, it's uncompromising, difficult and quite, quite brilliant. If you are prepared to put the effort in this story will reward you magnificently, an incredibly inventive with an engaging story and wonderfully rich characters. Written on 24th October 2012 by Ant.